On the first day of Spring, on a beautifully warm day, Montagu business owners came together to showcase their products and services. This Montagu Ashton Tourism initiative, a first for Montagu, ended up to be a total success with next years indaba already being planned. Most visitors to the indaba - mostly locals - were overheard making comments such as ... "I had no idea these products and services were on my doorstep, right here in Montagu!". This was the exact purpose of this indaba, creating awareness. Roughly 40 stall holders filled the KWV Art Gallery courtyard, wtih visitors coming and going from 10am - 3pm. What was so good to see, was the diversity of products and services on display. Making my way around the yard, I started off chatting to the team at the Montagu Museum. Estelle really knows her stuff regarding herbal teas for all kinds of ailments. These teas are produced and sold locally and are gaining popularity at an amazing pace. I also had a great chat with Ronel Neethling Interior Design and Laresa Perlman, Montagu's resident professional photographer. It was fantastic to meet Johan and Mari from Ojori Creations Montagu, specialising in cutting and engraving services of virtually any material. Also Johan and Elsje from Jumping Jackal, showcasing their "Sriracha Sauce", a barrel aged mild chilli-based sauce. 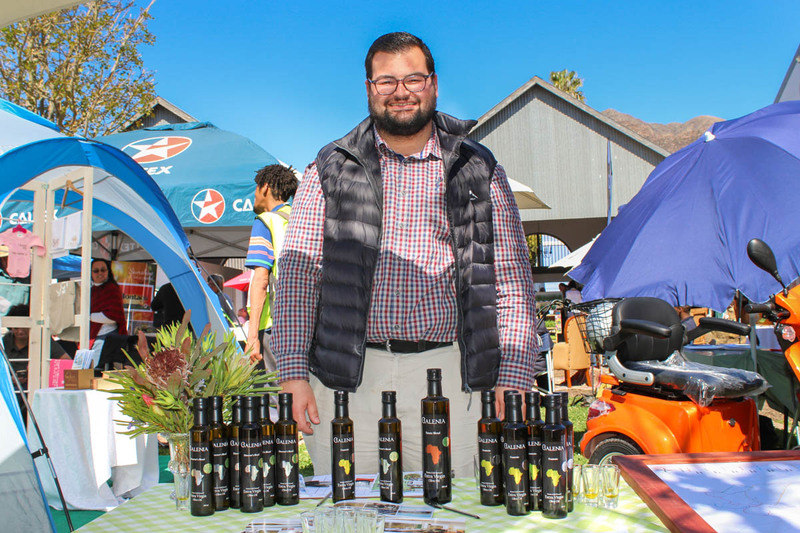 Montagu local produce is always well represented at events like these, with well known brands such as Church Street Jams, Montagu Dried Fruit, Werners Meat Market and the team at Mimosa offering delicious edibles at their usual high standards. Anelda from Living Greens Co, Diana from Diana's Deli, Janet Bourhill from Alpaca Paddocks and Monique and Stefaan from Jules and Co were all present and enjoyed the day. Montagu was fortunate to welcome Beverley Schäfer, chairperson of Economic Development, Tourism and Agriculture and a member of the Democratic Alliance, who gave a talk on small business in South Africa. A handful of small business owners attended, keen to hear how they could further improve their business in the challenging business climate of South Africa. Business owner in Montagu? Be sure not miss out next year!